When you decide to spend your next vacation at one of the luxurious hotels or resorts belonging to the Tafer brand collection such as Garza Blanca Resort & Spa in Puerto Vallarta, you can definitely expect unforgettable experiences at every turn. During your stay, you will have access to a variety of splendid activities that will take your romantic vacation to the next level. Water sports are especially fun to try with your partner, and tandem kayaking is one of the most pleasurable things you can do together as a couple. 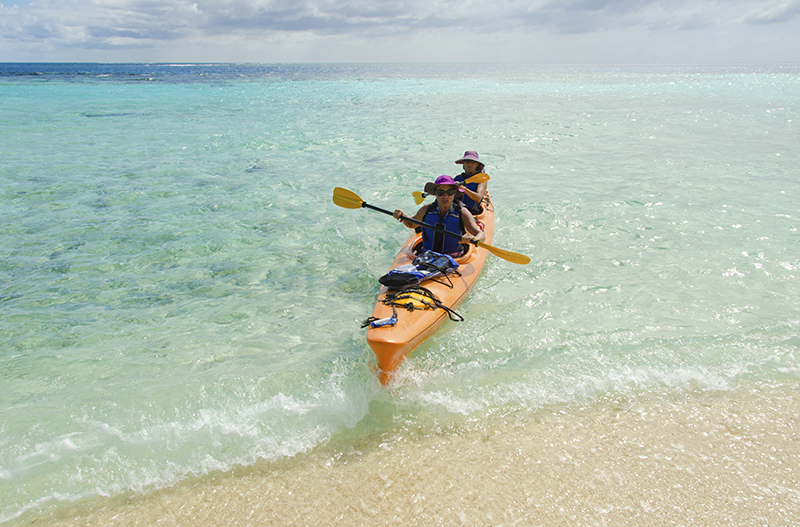 You will be able to take advantage of spending some time on the water in a two-person kayak with the one you love. Get to know the incredible natural environment that envelops you with a tandem kayaking adventure, traveling to landmarks such as the surreal Los Arcos rock formations along the southern shore of Puerto Vallarta. There are few activities as ideal for couples as tandem kayaking, which allows you to explore the serene beauty of the local marine habitat while also taking in stunning views of the scenery above the water’s surface. What better way to intensify your connection with one another than with an activity that encourages teamwork? Traveling by tandem kayak, you will both be able to see everything around you from a whole new perspective, including each other. In addition to spending quality time together while sharing a unique experience, you will also be doing great things for your overall wellbeing. Benefits of tandem kayaking include improved cardiovascular health, an increase in upper body strength, better developed coordination and a blissful state of mind. 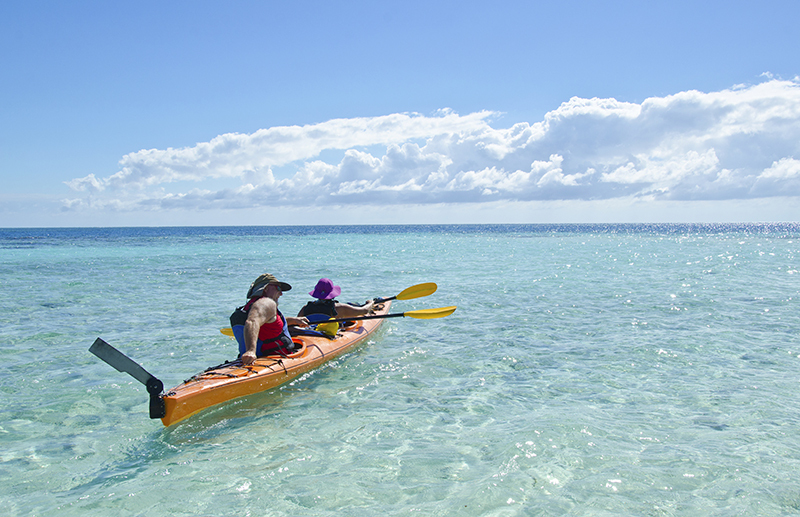 There are two openings in a two-person kayak, one for each person. Instead of sitting on a raised seat as you might in a canoe, your legs will be stretched out as you sit inside of the kayak, leaving just your upper body free to do the work. There are special paddles that are designed just for kayaking which have a blade on each end, allowing you to move the paddle from one side of the kayak to the other with ease and efficiency. Discovering the best way for you to get around in a tandem kayak is a fulfilling challenge that will ultimately bring you even closer together. You will need to remember to be patient with each other. Along with some practice, you will soon learn to coordinate your movements and work together. Once you are able to figure out a rhythm that helps you move in harmony and propel the kayak effortlessly across the water, you may feel confident enough to go a bit further than you originally planned. Remember to cut each other, as well as yourself, some slack as you navigate through this exciting and sometimes tricky process. It is important to decide which one of you will sit where before heading out. The larger, stronger person is typically better suited to sitting in the back since they will be able to steer and propel the kayak with more precision and strength. Start out by practicing your paddling skills individually before moving on and working together. Agree on which side each of you will begin on and then do a countdown before getting started. It might take a few tries, but soon enough you will figure out a speed that both of you can enjoy. Keep in mind, the entire process will be much easier if you are able to communicate well for the duration. A tandem kayaking adventure with your partner will not only give you a fun challenge to conquer together, it will provide a romantic experience that will make your vacation truly unforgettable!